The train project is picking up steam, now that the castle is finished and my LEGOLAND reporting for the 2013 season has been completed. Note: You can click the image for larger a version. In the middle row, on the left, brand new black parts for the 7740 Inter-City Passenger Train, new red parts in the middle and on the right some assorted tracks from my childhood collection (those manual points won’t work for a 12V train, but would work with the Power Functions modification). I also have the 12V Transformer and a couple of pieces of the 12V track system (not pictured here). I am not building the full 7740 Inter-City Passenger Train oval, though. On the bottom row are my train related BrickLink acquisitions on the left and right (some very recently arrived), mainly yellow/red train doors, windows and special parts on the left, and on the right 1980s train wheels, buffer beams/couplings, grey roof parts/plates and, most importantly, the 12V train motor in black. Luckily a lot of these old special parts are a lot less dusty and dirty as my childhood collection parts are. There are also a few redundant pieces here, e.g. leftovers from Quest for Lion Knights’ castle, but most of the stuff on the bottom will go into the train. 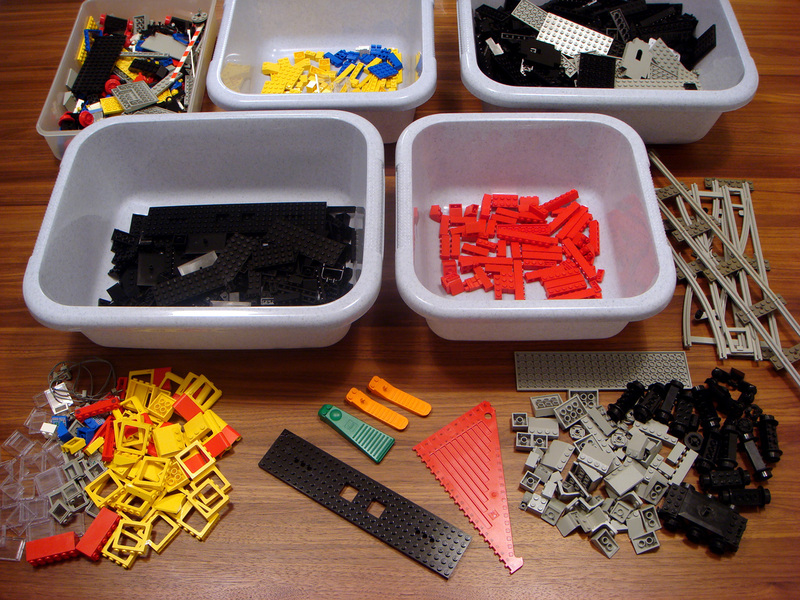 In the bottom middle, with the new train baseplate, are my ever important tools: 630 Brick Separators and the Designers’ Tool Set.